Location: Norbreck Castle Hotel, Blackpool. Date: May 3rd & 4th 2014. 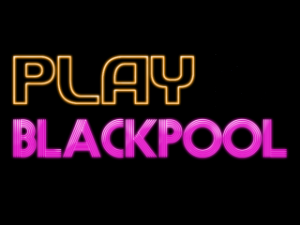 Hosted by Replay Events, PLAY Blackpool is an annual retro gaming expo held in everyone’s favourite/hated seaside settlement. 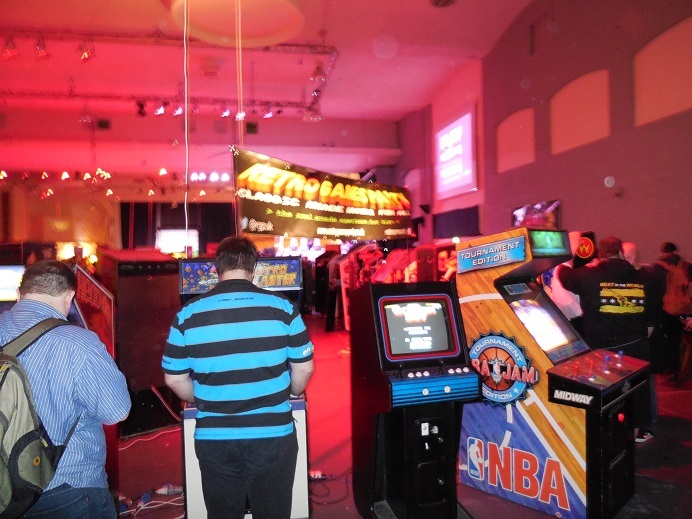 But when Stag Do’s, Hen Parties and Rollercoaster fanatics are not on the menu, it is host to the Mecca for every retro video gamer. 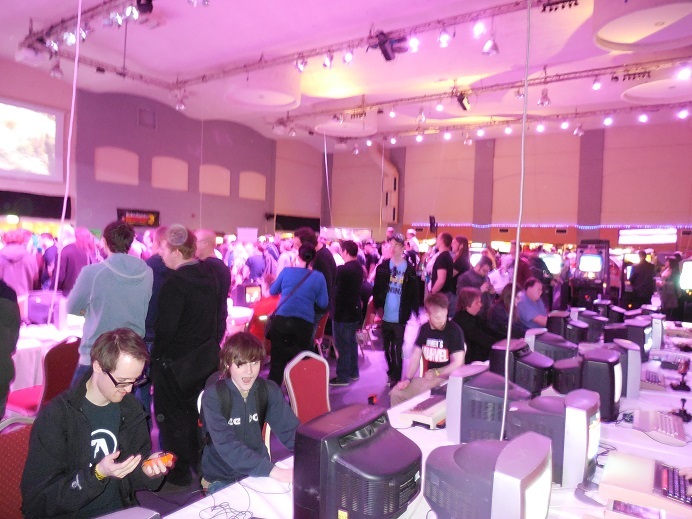 Featuring presentations from developers, classic arcade machines, a huge array of retro systems on display, gameplay tournaments and traders, it’s a must visit for any gaming enthusiast. Held over two days, I spent the Saturday in a pixelised nostalgia heaven whilst meeting up with many like-minded people whom I have only ever spoken to over the interwaves. So with a degree of trepidation, I was really looking forward to it. Setting off from Hertfordshire, the journey would approximately take 3 and half hours, but I had to take a slight detour to pick up fellow Youtuber Scott, but after that it was an easy journey with no delays. The fruits of leaving early, I so recommend this! Norbreck Castle Hotel is on the northern side of Blackpool, the opposite end of where the Pleasure Beach amusement park is located, so is easy to find once you are on the promenade road. To be honest, the hotel and attached exhibition centre is in a little bit of disrepair, and could do with a refurbishment or at least a new coat of paint. That said, there is a generous amount of free parking and good transport links via the tram system. Also, everything you would require in situated within the establishment, including cash machines, restaurants, bars and so on. Signage inside for the event was not brilliant at the very start, but that was soon addressed and people made their way around with ease as the day wore on. There are some handy local shops outside the rear entrance as well. So, aside from looking a bit shabby, the centre is amble in size and is laid out straightforwardly, adequate for such an event. The primary reason for visiting Play is to see the exhibits, but a big part of my visit was also to meet many of the people in the gaming community that I and many others are in contact with over the internet. This was terrific, and makes you feel a lot more comfortable in the busy, sometimes clustered environment having people to talk about the systems and cabinets on show, discussing the games and playing in the tournaments together. 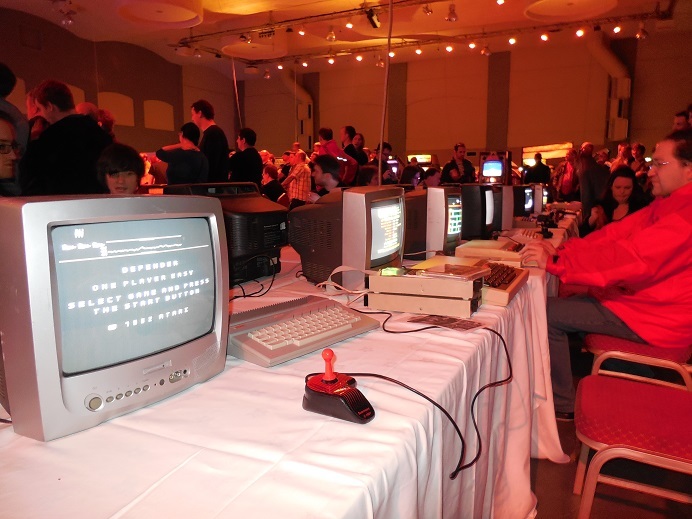 Displayed across three main areas, first up was the concourse which was full of dealer demonstrations and retro computer systems, most of which were usable or playable. This was a more quiet area, and was used by many as a chance to escape the noise and kerfuffle of the main hall. It was nice to see so many old computers and be given the chance to feel what they are like and how they were to use many moons ago. A second concourse was given over the PC Multi-play, and there was also a small side room dedicated to the role-playing genre in all forms. The focus of the expo was of course the large exhibition hall, where a bountiful amount of retro coin-ops, consoles and special exhibits were crammed in. Classic cabinets like BombJack, Chase HQ, Defender, Outrun, Dig Dug, Pacman, Pole Position and so on were all fully working and available on free-play. On some of the more popular arcades you would find a short queue, such as the original Star Wars shell, but by and large waiting times to have a play were minimal. It was wonderful to relive some the past memories these games muster by their sounds and looks, and also provides a stark reminder on just how damn difficult some were. It’s worth noting that many of the arcade games were on continuous play, so it was not always possible to start on level 1 for example. With half of the hall given over to the arcades, the other half was banked with rows of tables, all chock full with retro systems from yesteryear. Over 50 machines maybe, ranging from Dreamcast to Atari 65XE to even a Commodore 64GS! This gives a unique opportunity to try out systems you haven’t ever played, and again with very little, if any, queuing. I enjoyed this part of the event significantly, as ripples of goose-bumping nostalgia hit me again and again, and then I’d try something new. Well, old, but… new to me. I would think it would have been a similar experience for many in attendance. 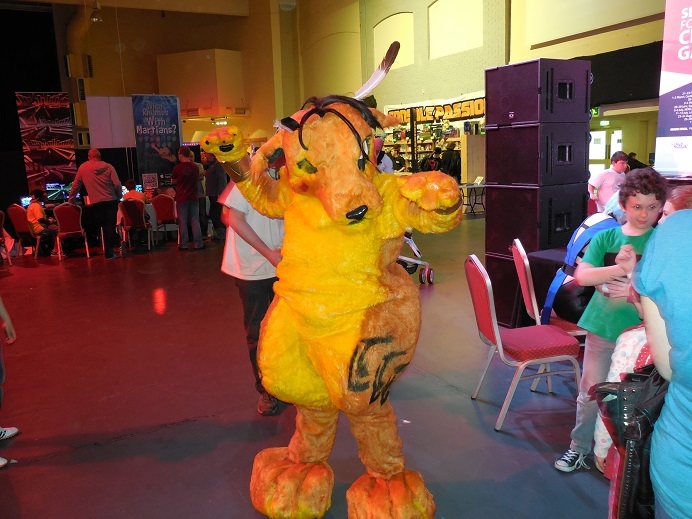 It was slightly distracting the concentrate on a game due to the lively ambience of the hall, predominantly dark with interchanging coloured lighting and a mixture of music from various sources. But I suppose this is to be expected with the subject matter. 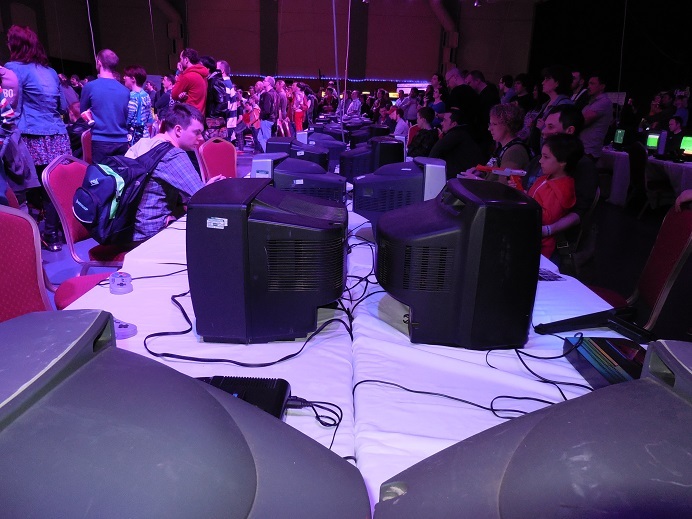 Scattered around the sides and atop a stage area were special exhibits, areas given over to retro gaming competitions on classics like Super Mario Kart, Rock Band and Street Fighter II. 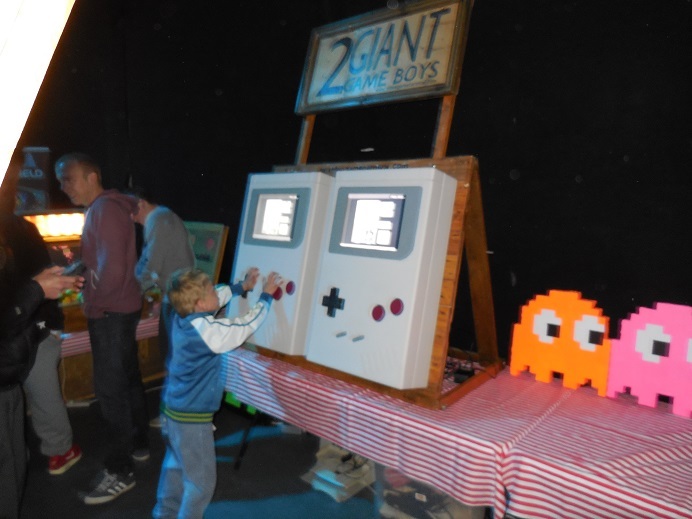 Giant playable Game Boys and oversized 2600 joysticks adorned one edge, and the stage area played host to cosplay competitions and more PC multi-play. In all directions, no matter what your gaming preference, everything was catered for save for the currant generations systems. These took a welcome vacation from the show. However, up and coming tech was featured, such as the tantalising Oculus Rift VR sets and the odd promo for upcoming currant-gen systems. All in all, it was an excellent balance of the retro gaming spectrum (yes, they were displayed too!). The third area was given over to the traders in retro gaming. Placed in a smaller room then the others, with a big-screen multi-play session at one end, a decent variety of game traders and associated products was on offer. Predictably there were plenty of PlayStation and Xbox titles present, maybe too much, and a considerable amount of older Nintendo stuff too. I would have liked to have seen far more 8 and 16 bit coverage, especially Atari, Amiga, Amstrad, NEC and Spectrum formats. There was little of this, maybe one or two stalls or trays. What was there was at a premium. Only one seller had 3DO and CDi titles, there was more choice of Neo Geo CDs and carts on display. Handheld systems were covered across the board very well however, including some good boxed systems, accessories and refurbishment services. Prices were as to be expected; very few true bargains available with many items going to the usual or slightly inflated rates. Some were exceptionally silly. A boxed Game Gear for £135 when you could pick up a Neo Geo CD for a more reasonable £75. Waaay too much for my liking. I did pick up some good purchases, but I haggled the sticker price down in all my buys. The sellers were gladly open to a little wheeler dealing. Overall it was a fantastic day out for a retro gamer such as myself, with many highlights and pleasant surprises. Seeing old familiars again or having the chance to play a console for the first time, it ticked a lot of boxes. 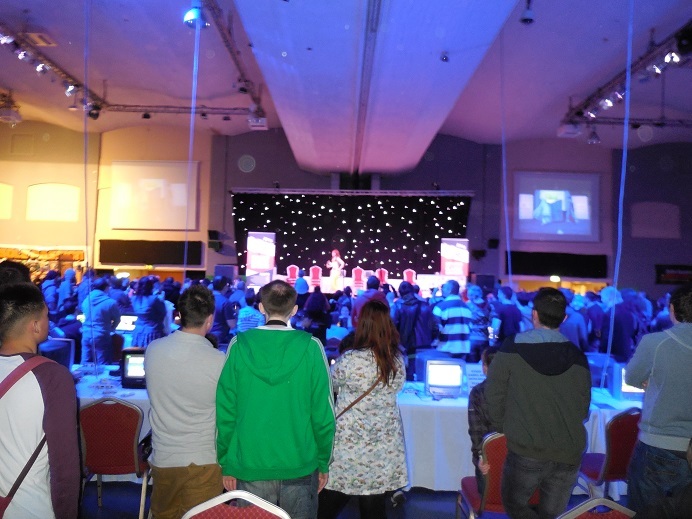 Like I have already said, the real reason for attending for me personally is meeting up with people in the gaming community, for as much a bad rep the media would give us, 99% of gamers are really nice human being and not the recluse, unhinged psychos the tabloids would make us out to be. I will hopefully be visiting next year on the strength of this expo, spending both days to really get the full experience. I recommended heartedly that you join me.